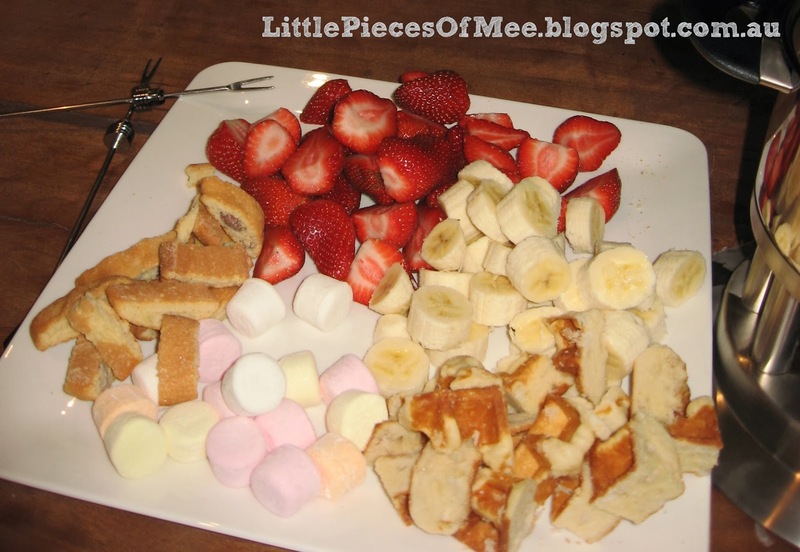 Little pieces of mee: Fondue night! I've been wanting to do a fondue night for ages - I bought a fondue set about 3 years ago after having a chocolate fondue for dessert at a mum's night out, but I hadn't actually used it yet. So I organised a fondue night with my husband's family tonight, and it was great! I actually made 4 different fondues - two savoury for the main meal, and two sweet ones for dessert. The savoury ones were the classic cheese (although made without alcohol so that the kids could enjoy it too) and a beautiful tomato and capsicum one. We had two identical platters (one for each end of the table) and ate almost all of the food between 7 adults and 5 young kids. The recipe I used for the cheese fondue was from Spoonful. I made it exactly as the recipe is written so I won't repeat it here. The recipe for the tomato and capsicum sauce was based on this Fondue Español from Food52 but with a few modifications to suit our family. I used both almonds and cashews as I didn't have enough almonds on hand, but I really liked the flavour of the cashews in the dish. This was a delicious fondue sauce - definitely one to make again, and it would probably work well as a pasta sauce too (although with a bit less cheese). 1. Preheat oven to 250C and line a baking tray with baking paper. Core, halve, and seed the tomatoes (pole to pole). Halve red capsicum (also pole to pole), and remove stems, seeds, and ribs. Arrange tomatoes and capsicums on the tray, cut sides down. Bake until skin is charred. Rotate the capsicums if needed to ensure even charring. The tomatoes may be done faster than the capsicums. Place capsicums in a plastic bag and close, then set aside for 5 to 10 minutes. Slip the skins off the tomatoes and peppers. Place tomatoes and peppers into bowl of food processor. 2. Place water and red wine vinegar in a small sauce pan. Bring to a boil then remove from heat. Tear bread slices into chunks and add to pan to soak and set aside for a few minutes. 4. Transfer sauce to a medium sauce pan. Bring to a simmer over medium-low heat. Add the cheese a handful at a time, stirring to melt between additions. Once cheese is fully incorporated, season if needed then transfer to fondue pot and serve with your choice of dippers. - waffle pieces (I cut up some store-bought waffles into large chunks) - this was a bit hit with everyone! One of my favourite combinations was a slice of banana and a chunk of waffle with the caramel sauce - it was heaven! Place sugar, cream and butter in a small saucepan over low heat. Cook for 2 to 3 minutes or until the sugar has dissolved. Bring to the boil. Reduce heat to medium. Simmer for 3 to 4 minutes or until slightly thickened. Pour into fondue pot and serve. Heat cream in a saucepan (or microwave) over medium heat, until almost boiling. Add chocolate and stir until melted and smooth. Pour into fondue pot and serve. I can't wait to do another fondue night!